I saved my two favorite cards for last. 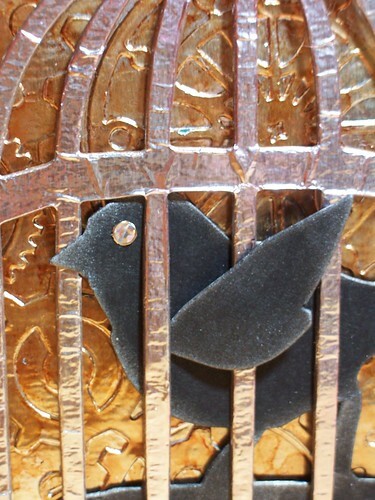 First up is the caged bird. I really love how this card turned out. I used the time pieces embossing folder by Provo craft with some tinfoil. The cage is also cut from tin foil. I got the yummy tarnished look on the background by combining latte and ginger alcohol inks. The bird is shaded with silver. The really neat thing about the caged bird die is the wing comes separate so you can make your bird look like it's taking flight or have the wing hang out of the cage like I did. My last card was a lot of fun. 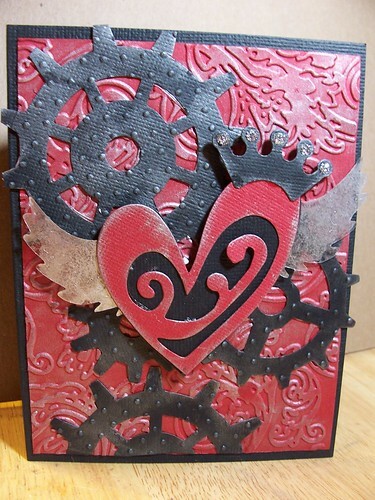 I used the winged heart again and the gears die. I also pulled out my texture fades by Tim Holtz (see told you, a collector). I accented everything with silver for this card. I've always been partial to red and black (my school colors growing up) and silver just seems to be the natural companion. To get the silver wings I cut them from acetate and then smudged some silver additive from my alcohol ink collection all over them. The crown is finished with silver stickles. The gears were embossed in the dotted Swiss folder (Provo craft) and covered in silver ink. 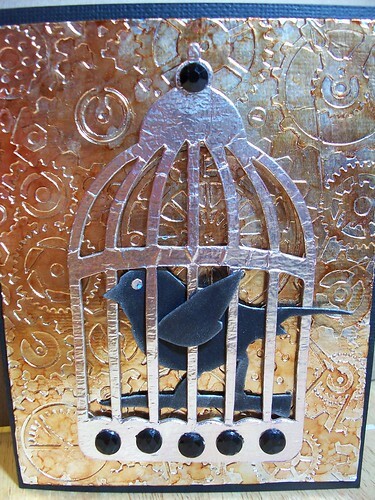 I hope you've enjoyed looking at my takes on the stash of Tim Holtz products I have. Hopefully I'll get them out more now. If you have your own stash (collection) I hope you'll pull yours out and let them get some use!